When scrapbooking your family history, sometimes you have hardly any information on a family of your ancestors, and sometimes, you may know a lot about one specific family. 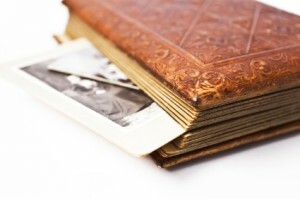 In this article, we are going to address the issue of creating an entire album around one particular family in your lineage. Let’s say that you have an old photograph such as the one pictured. You know a lot about this family, and want to honor them in an album all their own. So, let’s get started. On the very front page, you can title the album using the name of the father in the photograph. While this is not my family photo, we will pretend for this article, that this is the Joseph Jones family. So, on the very first page of your album, or the title page, you can put, “The Joseph Jones Family”. Use Alphabet Letters, or print the words in a font you like on your computer. Matte the title in cardstock to make it stand out. On the next page, start by creating a family group sheet beginning with the Mother and Father in the photo. Place on the group sheet a little about their ancestors and where they come from. Place this group sheet on the opposite side of the page from the title page. Then, include the main photo of the family on the adjacent page. That way, you can see the entire family, and see the group sheet indicating who they are, and where they came from. Underneath the photo of the family, include all the names of the people in the photograph. Try to indicate where they are in the photo by using words such as “bottom left”, or “in mother’s lap”. That way there is no confusion about who you are referring to. As you work on this album, use additional photographs of the individuals in the family to tell their story. If you have additional photos of the children, dedicate a page to each child in the main photograph telling what you know about them. Also, make sure to dedicate a page to the couple. Tell the story, if you know it, of how they met, where they got married, or what their life was like together. Make sure to include as much information as possible in this album about this one particular family. Include things like birth certificates, marriage certificates, newspaper articles, etc. to tell the story of who this family is, and why they are significant to your heritage.